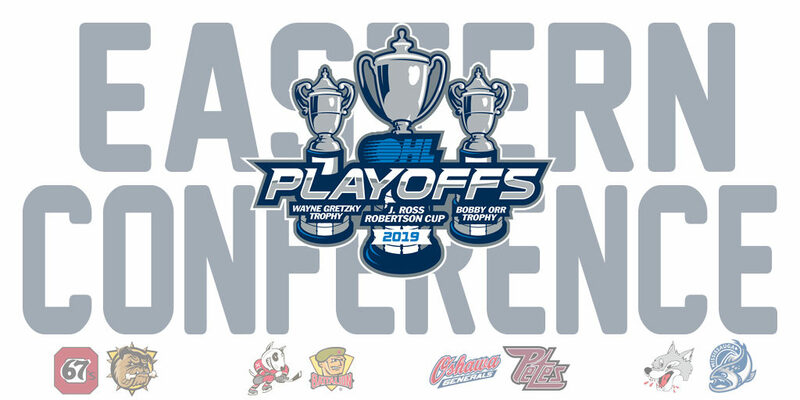 Eight Eastern Conference teams are set to begin their journey through the 2019 OHL Playoffs. Here’s a look at this year’s first round matchups. A rematch of last year’s first round series between the two clubs, the first place Ottawa 67’s look to turn the tables on the defending OHL champion Hamilton Bulldogs. The 67’s are fresh off a franchise record 106 point season highlighted by 29 wins on home ice and the league’s lowest number of goals-against (183). 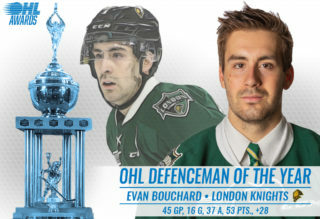 The OHL’s regular season champion is built for a long run with goaltenders Michael DiPietro and Cedrick Andree providing stability behind a high-powered offence. Dallas Stars prospect Tye Felhaber (59-50–109) led the way for Ottawa this season, scoring 59 goals for the most by a 67’s player since 2003. He joins linemates Austen Keating (22-67–89) and Marco Rossi (29-36–65) in forming one of the league’s most dangerous combinations. One can’t overlook 35-goal man Sasha Chmelevski (35-40–75) and seasoned overage veterans Kyle Maksimovich (35-46–81) and Lucas Chiodo (29-50–79) on the wings. While the three other teams at last year’s Memorial Cup missed the playoffs this year, the Hamilton Bulldogs snuck in, holding down the eighth seed in the Eastern Conference behind a 51-goal season from top NHL Draft prospect Arthur Kaliyev (51-51–102). Five other Bulldogs join Kaliyev in returning from last year’s roster including fourth-year captain Matthew Strome (28-51–79) and speedy spark plug Isaac Nurse (16-12–28). It’ll be an uphill battle for the Bulldogs, who will look to summon a little bit of last spring’s magic in a series against the OHL’s top team. This marks the second straight meeting between the 67’s and Bulldogs in the OHL Playoffs. Who will win the first round series between #OTTvsHAM? The Niagara IceDogs enter the 2019 OHL Playoffs with six straight wins, getting set to take on the rough n’ tumble North Bay Battalion starting Thursday in St. Catharines. Starring OHL scoring champion Jason Robertson (48-69–117), the IceDogs scored OHL’s most goals (326) since 2013-14 this season, getting additional 30+ goal seasons from Ben Jones (41-61–102), Akil Thomas (38-64–102), Jack Studnicka (36-47–83), Kirill Maksimov (40-39–79) and Philip Tomasino (34-38–72). Niagara scored a league-high 85 power play goals, finishing with the second-highest power play percentage of 28.1%. 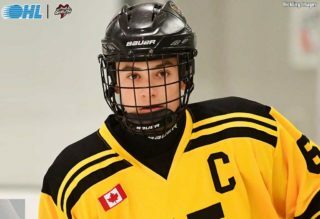 Overage veteran Matt Brassard (11-45–56) brought an offensive dimension to Niagara’s man advantage from the back end when he was acquired from Oshawa in January. In goal, Stephen Dhillon was the busiest man in the league this season, leading all netminders with 3,418 minutes played and 1,686 saves. He set new IceDogs franchise records for goaltending wins and games played as well as single-season victories. The Troops counter with 61-goal scorer Justin Brazeau (61-52–113) who set a new Battalion franchise record this past season. Supporting him are veteran centreman Matthew Struthers (31-50–81) and feisty winger Brad Chenier (30-35–65). Overage winger Luke Burghardt (9-21–30) will begin the series serving the second game of a two-game suspension. The IceDogs defeated the Battalion 8-3 on the final day of the regular season to clinch the Central Division. The Troops will try and improve on that result, but will have to clean up defensively against Niagara after surrendering at total of 31 goals over their six encounters on the season. This marks the second time Niagara and North Bay have met in the OHL Playoffs. The two franchises also clashed in 2011 and 2012 while the Battalion were in Brampton. Who will win the first round series between #NIAGvsNB? The OHL’s oldest rivalry hits the ice as the Oshawa Generals and Peterborough Petes go head-to-head in first round play. The Gennies have had Peterborough’s number, winning five straight playoff series against the Petes since 1997. 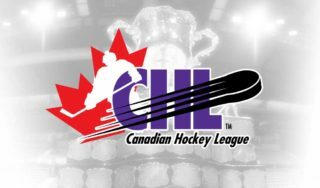 A veteran cast led by overagers Brandon Saigeon (37-55–92), Anthony Salinitri (48-40–88) and defenceman Nicolas Mattinen (18-43–61) looks to extend that number as Oshawa enters the playoffs hot, skating to a 21-6-1 record since the OHL Trade Deadline. NHL prospects in Serron Noel (Florida, 34-47–81) and Allan McShane (Montreal, 34-35–69) join midseason addition Brett Neumann (45-34–79) in giving Greg Walters’ Generals plenty of depth up front while Winnipeg Jets prospect Giovanni Vallati joins a pair of underrated shutdown defenders in Mitchell Brewer (4-14–18) and William Ennis (3-13–16) in rounding out the club’s top four defensively. 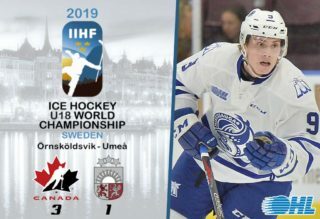 Boston Bruins prospect Kyle Keyser posted career-highs across the board this season and will go up against 2019 NHL Draft prospect Hunter Jones for Peterborough. The Petes boast one of the league’s best power play quarterbacks in San Jose Sharks prospect Ryan Merkley (14-57–71) who led OHL defenders in assists this season. 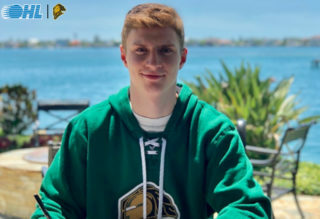 Winnipeg Jets prospect Declan Chisholm (5-43–48) comes off a strong month of March, recording nine points over eight contests. Peterborough surrendered at least six goals in each of their final four meetings with Oshawa this season. They’ll try and get some production of their own from NHL Draft prospect Nick Robertson (27-28–55), overage centreman Chris Paquette (29-23–52) and Detroit Red Wings prospect Zach Gallant (13-12–25) who was limited to 30 games this season with injuries. Expect plenty of physicality when these two clubs hit the ice on Friday in Oshawa. This marks the 14th time since 1975 that Oshawa and Peterborough have met in the OHL Playoffs. Who will win the first round series between #OSHvsPBO? The Sudbury Wolves are back in the OHL Playoffs, riding the fine performance of OHL Goaltender of the Year candidate Ukko-Pekka Luukkonen into first round action against the Mississauga Steelheads. The Wolves skated to their first 40-win season since 1994-95 as Luukkonen won 38 games and tied for the league-lead with six shutouts. The deadline addition of Calgary Flames prospect Adam Ruzicka (35-43–78) paid big dividends for the Wolves as the Slovakian centreman recorded 24 goals and 41 points over 30 games. NHL Draft prospect Blake Murray (30-20–50) also hit the 30-goal milestone while 2018 first overall OHL Priority Selection choice Quinton Byfield (29-32–61) was also an impact player. Nineteen-year-old winger David Levin (18-24–42), who has been out of action since Jan. 20th, is eyeing a playoff return and would give the Wolves another skilled body up front. Head coach James Richmond’s Mississauga Steelheads pulled off an amazing comeback win over the Barrie Colts on the final day of the regular season to leapfrog the Peterborough Petes into fifth in the Eastern Conference. It’s been a by-committee approach from the Trout this season as they played .500 hockey following the departure of stars Owen Tippett and Ryan McLeod. Overage leaders Cole Carter (35-33–68) and Alan Lyszczarczyk (39-43–82) finished the season strong while drafted and developed talent in Cole Schwindt (19-30–49) and Keean Washkurak (16-31–47) have grown into solid OHL competitors. The Steelheads brought in a number of names mid-season but have adapted well in front of workhorse netminder Jacob Ingham who got into 57 games this season. Like most other teams, Mississauga’s biggest issue against Sudbury this season was scoring goals. The hard-working Steelheads need to find a way to solve Luukkonen if they want to hang around in this series. This marks the first ever playoff meeting between the Steelheads and Wolves. The two franchises have met three times in total including once between the Wolves and Mississauga St. Michael’s Majors and twice between the Wolves and Toronto St. Michael’s Majors. Who will win the first round series between #SBYvsMISS?